To maintain grass plant health and structure. 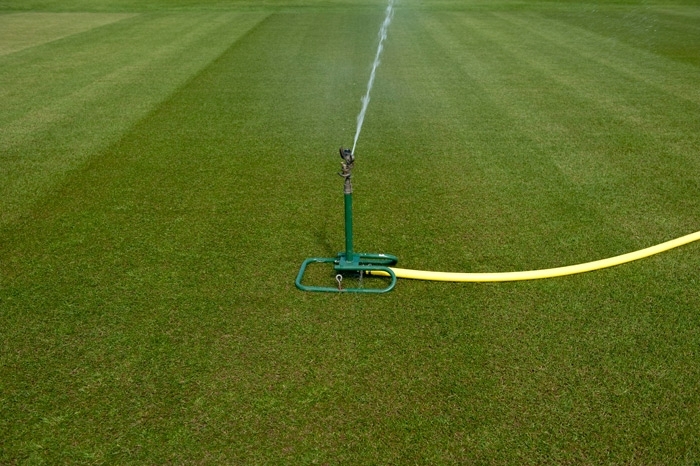 Irrigation is essential in the preparation of pitches to create pace and bounce. It is used to cool the plant, to wash in fertiliser and aid grass seed germination. The range of application method is very wide from the watering can to the automatic irrigation system controlled by computer. Water pressure has a big effect on the quantity of water applied. The irrigation of pitches must be even to produce even pace and bounce. The ideal time to water is in the evening when the sun has lost it power. Never irrigate in full sun and insure you water the profile to a depth, not just the surface. Make sure the surface has time to dry before it is used. If you do not water to a depth you can produce a crust which may lead to the top of the pitch breaking up. Ensure you water to a depth to encourage deep rooting; just watering the surface will cause shallow rooting and possibly a profile break which will lead to a slow pitch. Watering can, hose pipe, self-travelling sprinkler, automatic pop-up system with tank and pump. Check your league rules as there is often a rule stating no water should be applied some many hours before the start of the game. If you are considering a new pavilion, equipment shed or outfield drainage, give a thought to water harvesting to reduce your water bills.